The educational software programs offered below have been designed and produced by TASA Graphic Arts, Inc. These programs are ideally suited for students who prefer self-directed study opportunities in preparing for standardized tests and academic competitions, or to fulfill a strong desire to simply learn more about the particular topics of study. Other Worlds Educational Enterprises, LLC, is pleased to offer these exemplary educational software programs to assist students in developing topographic map reading skills, enhancing their understanding of the theory of plate tectonics, exploring the wonders of rocks and minerals, and gaining basic knowledge or the Earth's atmosphere.. 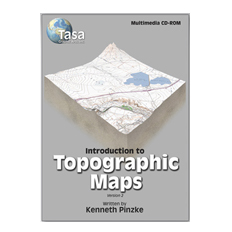 Version 2.0 also runs on Mac OS® X Lion (10.7) and Mountain Lion (10.8).With Introduction to Topographic Maps you will learn how to use these maps to determine elevations, landform types, principles of scale, location, and much more. You will read and draw contour lines based on points of known elevations, construct topographic profiles, and determine slope and relief. 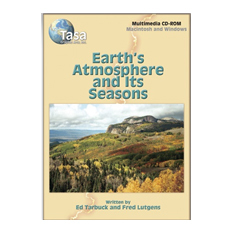 Includes full color photos, animations, related topics on Map Projections, U.S. Geological Survey, Using a Compass and Map, and more. Intended for grades 7 through 12 and college. To order a version upgrade, click the Buy online button or call 1-800-293-2725. Narration to aid in reading comprehension. Draw contour lines and print out your results. Scored review section can be printed for easy teacher assessment. Larger display window that can be moved and resized. USGS Booklets are included on the CD-ROMВ as pdf files. Written by Edward J. Tarbuck and Frederick K. Lutgens, Illinois Central College. Illustrated by Dennis Tasa.Version 2.2 is compatible with Mac OS® X Yosemite (10.10). 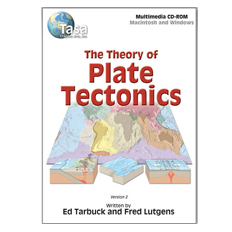 The Theory of Plate Tectonics is a dynamic exploration of how Earth's lithospheric plates change through time. Version 2.2, fully narrated, embarks on a new way to study this exciting theory. All artwork enhances the understanding of the topics covered including many animations, which are easily manipulated by the user. Included is an illustrated glossary with audio pronunciations. An index makes it easy to jump to selected frames covering a specific geologic term. Navigation throughout the program is easier with fast forward, fast reverse, jump to a numbered frame, glossary, and index buttons available on every frame. Review activities are scored and may be printed for easy teacher assessment. Version 2.2 now appears in a window that can be moved and resized. This CD-ROM includes two levels: Intermediate and Advanced (Grade 7–12 and college). Written by Edward J. Tarbuck and Frederick K. Lutgens, Illinois Central College, and Edward Greaney, Hunterdon Central Regional High School. Illustrated by Dennis Tasa.Version 1.4 is compatible with Mac OS® X Yosemite (10.10). The Wonders of Rocks and Minerals explores the world of geology in an exciting and highly interactive way. What are minerals and how are they different from rocks? What are the three groups of rocks and the geological processes involved in the formation of each? You will learn to identify and name minerals and rocks, just like a geologist does on a field trip. 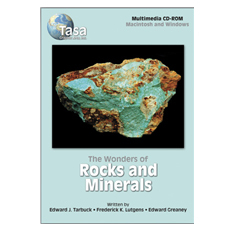 Includes stunning photographs, full color animated sequences, a glossary, interactive exercises, and an illustrated database of over 50 minerals. Includes two levels of study: Elementary (grades 3–6) and Intermediate (grades 7–12).